Buenos Dias (Good Morning) from San José! Course participants are in the process of arriving at the Juan Santamaría International Airport in San José. While we are waiting we thought it would be nice to show family and friends where we are in the world, and the size of Costa Rica in relation to the greater Los Angeles area, from where most if not all of our participants are traveling. It really puts things in perspective! 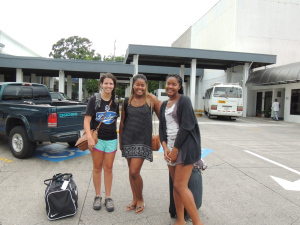 Course participants traveled overnight and the first group arrived at the San Jose’ airport, where after they went through Immigration and Customs, were shuttled by our MVI guide, Mark Wainwright, to our first place for lodging, the Costa Rica Tennis Club. This location offers great rooms, hot showers, amazing food, unlimited hot and delicious coffee and tea, and unsurpassed hospitality, which students will need after a long night of travel! See this website link for information on the Tennis Club. Students enjoyed a nice breakfast and will have free time until we reconvene at 3:30 for our first group meeting and then a presentation by Mark on the History of Costa Rica. Meeting and presentation notes to be posted later today. Students will then have dinner together at 6:30 in the main dining area. 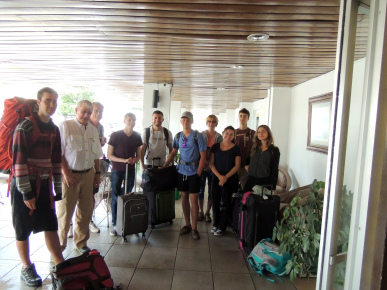 Pura Vida and best wishes from our LMU group on this, our first day in Costa Rica! Professor Auger then went over course requirements and the good/bad news that the course is only 17 days but that the final project has to be done in that time. He went over various suggestions for topics based on students’ majors and interests and suggested students team up on topics such as videography, hummingbirds, macrophotography, vocalizations/dialects, turtle nesting, etc. He suggested ways students could present their information such as via a report format, poster that could be presented at the LMU campus when appropriate, video documentary, powerpoint, etc. Professor Auger will meet with students as necessary to help them decide on a topic or discuss research methodologies, etc. After an amazing presentation on the history of Costa Rica, Mark reminded students that we would never be doing the same thing twice, so he encouraged everyone to make the most of each day. After the meeting we had another delicious meal at the main dining area, discussed the plan for tomorrow, and headed for some rest. Tomorrow begins our adventure to the various regions of Costa Rica! We are ready for an amazing adventure and learning experience.